Residents at New Care’s Grosvenor Manor care centre on Heath Lane in Chester are hitting all the right notes following an uplifting visit from the City of Chester Brass Band. 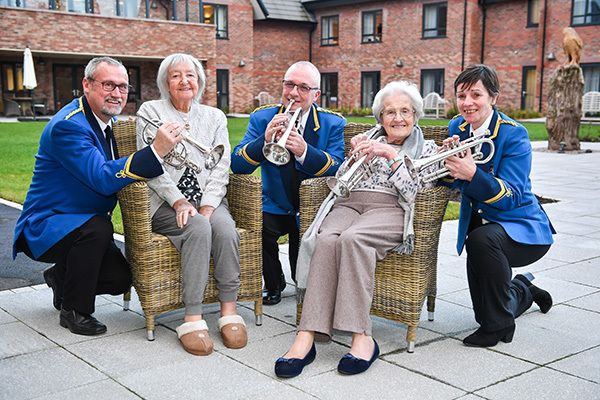 The 28-piece band, Chester’s longest established brass group, visited the state-of-the-art care home to play a series of uplifting tunes for residents and their loved ones. The afternoon comprised a musical extravaganza that included both old and new tunes including well known songs and more classical instrumental pieces. The event was a huge success that had heads bobbing and toes tapping, and will leave a lasting legacy of many wonderful memories with the residents. Proud to represent the city for more than 150 years, Chester Brass Band has a fine cultural heritage. Formerly the Chester Blue Coats, the band wears a distinctive blue blazer that carries the city’s name and a badge of the famous Eastgate Clock, recognisable all around the world as a symbol of Chester. Located on Heath Lane in the historic city of Chester, Grosvenor Manor is a ‘new generation’ care facility that features 81 fully furnished bedrooms, all with private en suite wet rooms, a range of stylish and elegant communal lounges and fine dining rooms, a nail bar, hair salon and beautifully landscaped gardens and outdoor areas. Designed, built and operated by New Care, one of the UK’s fastest growing development-led care home operators, it has been setting new standards for care and making a significant impact in the local area since it opened almost 12 months ago. Grosvenor Manor provides an exceptional clinical offering including residential, nursing and dementia care services. All residents receive individual, person-centred compassionate care enhanced by meaningful daily activities to build confidence and encourage mobility and independence. For further information, please contact Dawn Collett on 01244 305330 or email enquiries@newcarehomes.com. Alternatively, please visit www.newcarehomes.com.